Every other year the Chilebrown household replenishes the Chipotle pepper supply in the pantry. It was time to break out the designated chile smoker. A combination of woods was used. Peach, Hickory, Almond and Sugar maple blended to create a perfume of smoke that should be bottled. Ms. Goofy and I went to the Alemany market in San Francisco to buy 10 pounds of ripe red jalapenos. Once smoked, these peppers will compact to one pound of pure smoke heaven. Once the peppers are purchased, give them a good rinse with water and let them air dry. The smoke should be a cold smoke. The temperature should never go over 125 degrees. Six to ten charcoal briquettes were ignited away from the smoker. The lit charcoal was place in an offset firebox. The combination of woods was placed on top of the live charcoal. All the vents were closed to keep the heat low. I would let the fire and smoke burn out and would start the process over. This went on over a three day period. The chile's absorbed a good amount of smoke. 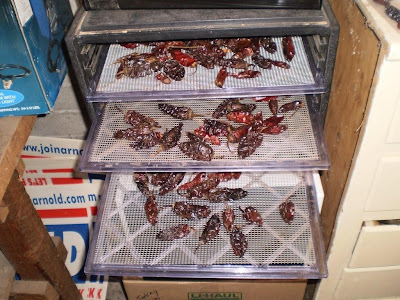 They were then finished off in a dehydrator. This only took a 24 hour period. We now have a two year supply of home smoked chipotle. If you try this at home, be sure to clean your smoker of all grease. You do not want your peppers to taste like last nights brisket. A designated chile smoker is the way to go. It is time to make some salsa. Nice-How do you store them (do they need to be frozen)? I portion them out into 1/4 ounce bags. Then they are used as directect. They will stay great for a year in zip lock bags. The next needs to be stuck in the Frezer. They will last a very long time. these are to die for... Great job. Thanks A Year on the Grill. Stop by anytime. I will be curing and smoking some bacon later this week. Truly awesome! I love to buy these dried chipotles, but making them is super cool. I think the dried ones are much more versatile than the ones packed in adobo.